This cool space wallpaper reveals an artist's concept shows NASA's Dawn spacecraft orbiting the giant asteroid Vesta. The depiction of Vesta is based on images obtained by Dawn's framing cameras. 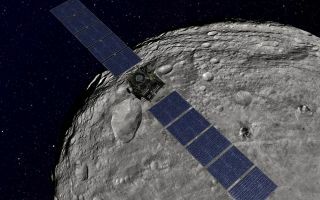 Dawn's mission to Vesta and Ceres is managed by JPL for NASA's Science Mission Directorate in Washington.